How the developer took its soundtrack on the road. The Chinese Room cofounder and composer Jessica Curry summarises her initial pitch for a live performance of Dear Esther in a typically humorous manner: "I've had this possibly really bad and commercially unviable idea—how would you feel about it?!" She was speaking with the Barbican's Contemporary Music Programmer, Chris Sharp. The idea came during a Film, Archive and Music Lab (FAMLAB) week Curry was attending. "They were talking about composers and how they work with silent film in terms of putting that into a concert experience," she says. She began to ponder that in relation to her expertise in videogame music. Sharp has previously summed up the Barbican’s work as ‘Slightly Insane Ideas Made Reality’, so Curry’s proposal would seem a perfect fit for that remit. "They were amazing from start to finish," she says of the Barbican. "They were really creatively on board with it but also incredibly practical, because what we quickly discovered is that it was technically really challenging." One of the key challenges was that the live performance would require Dear Esther to be rebuilt. The most obvious reasons are that, for a live show with live narration and music, the existing music and narration needed to be stripped from the game. "I thought it can’t be that hard but you know what it’s like with game development—you change one thing and everything starts crashing around you!" says Curry. The game was five years old by then and The Chinese Room had to relearn the processes and idiosyncracies of the original in order to tweak it. "The QA involved in that was massive because so many dependencies had changed," explains Curry. 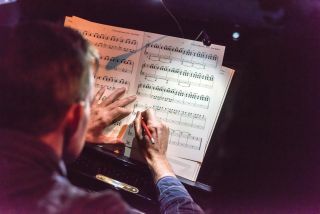 The conductor and actor also needed the game to provide cues for the different pieces of music or segments of script required. That meant re-evaluating how the tripwires in the game—the triggers for things like segments of dialogue—worked. In the original game the idea is that you get a different experience each time you play because there are a huge number of possible permutations. That’s fine when you have code handling those responses. When it’s a human on stage the limitations are different. Fellow Chinese Room cofounder Dan Pinchbeck thus needed to create a version of the script which catered to the limits of a human performer and to the fact that attendees would likely only attend one performance. I ask about the logistics of the tripwires given you’d need to factor in a few extra seconds for a human to respond to a prompt from the game. "Now you’re beginning to understand the fresh hell I led everybody into!" laughs Curry. It wasn’t just figuring out cues and removing elements of audio. Invisible walls had to be added a week before the initial show to prevent the player falling off cliffs during a performance. There was also a long discussion about whether to keep or remove the game’s loading screens. Curry tells me it was a conscious choice to leave the loading screens in. The idea was "to not apologise for it being a game" and instead to celebrate it. That’s how it worked for me, but others found it jarring. It’s a peculiarly technological moment in a very human performance. In general, decisions about what to change and how were governed by whether they helped create a live version of the existing game experience rather than a separate, perhaps more theatrical, entity. That said, in game form Curry had been able to exert absolute control over how Dear Esther sounded at any given point. As a live performance, she had to figure out how to separate out the elements so they still worked cohesively but could be differentiated by the listeners. Each venue also introduced differences to the sound and the team had mere hours to figure out how to adapt each night. Having an experienced crew helped, as did a sound engineer with both live expertise and a more detached perspective: "Sometimes, because I knew the soundtrack so well in my head it was almost like I couldn’t hear a new version of it," Curry says. The human player is another performance element which has changed over the tour. By the final UK date the PC monitors had gone from being side-on to facing the audience and the player was now lit in the same manner as the musicians. Curry and the team are still tinkering with that presentation for the international dates. Live performance also introduces the possibility that part of the show will break. As a result there are two projectors and two computers in place, plus a screenshot to cut to in the event of some tech failure and emergency music specifically written by Curry to cover downtime. Stresses aside, the resulting Dear Esther tour has been a rewarding and rejuvenating experience for Curry. The close-knit team offered a protective, nurturing environment, and the instant positive feedback of a live audience enthralled by her work has been a delight. Whether the success here is transferrable to other live games events is a difficult question. Dear Esther is about 75 minutes long, was made on a tight budget with one narrator and few musicians, and is the product of a studio that’s interested in removing traditional ‘play’ elements from games. It’s suited to a live show in ways that hundred-hour epics with action sequences and full orchestral scores aren’t. Regardless, Dear Esther’s live tour was a technologically fascinating and emotionally rewarding experience.